Hello all! It’s Caroline here! I hope everyone is having a lovely start to the year! Now that both New and Old Calendar Orthodox have celebrated Theophany, I thought I’d share some resources that have been very helpful to us when preparing for house blessings. Our first parish, St. Athanasius Orthodox Church in Nicholasville, KY printed out the house blessing prayers on a little booklet, complete with brief instructions on how to prepare for a home blessing. I found it super helpful, so I shared the link to it at the bottom of this post! Secondly, it has really helped me when I have a clear picture in mind before I lay out my materials. This year (in addition to the January activity from our 2019 calendar), I created an easy printable that your kids can use to help you seek and find the appropriate materials in your house. It’s simple in it’s layout so that you can even set on the table and place your items on top of each shape as if completing a puzzle. Notice that there’s a significant amount of blank space here. That’s because a house blessing is simple and the focus should really be on the icon or icon corner where you are standing. Listen to the troparion for Theophany so that your family can sing along while the priest blesses the house. 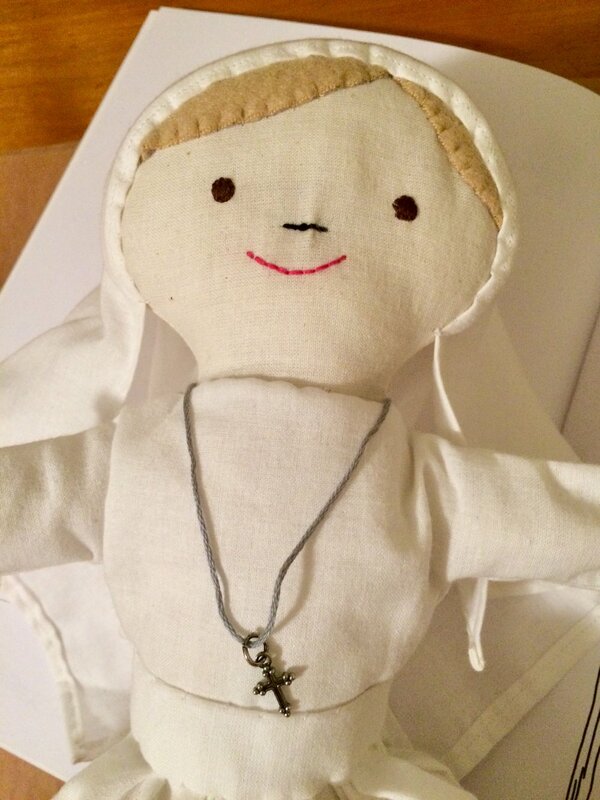 Have your kids pretend to be the priest and walk around the house blessing or censing it. Have them remove any toys that are in their way and in turn would be in the priest’s way as he walks though the house. We hope these resources help your family during this special season in our church! Below are links to the House Blessing Printable and House Blessing Service Booklet. HOUSE BLESSING SERVICE BOOKLET - Special thanks to St. Athanasius Orthodox Church in Nicholasville, KY for putting this together! I don’t know about you, but I almost always get my kids books for Christmas and birthdays. Plastic toys certainly have their place in my home (why does it seem like that place is always under the couch?! ), but I never regret giving books! Recently I read the newest book by Melinda Johnson, The Barn and the Book. What a sweet story! (I’m not going to lie, I teared up at one part…but you’ll have to read it yourself to find out why!) The book is a sequel to Shepherding Sam, and while they’re both chapter books, they’re meant for young readers (I think even 3-5 year olds would enjoy hearing them read aloud). The spaced out print and engaging story makes it feel like the book flies by— always encouraging for little ones who are just adventuring into the world of chapter books. Disclaimer: My 3 year old is definitely NOT reading herself a chapter book— she just enjoys the pictures in the book. And cat snuggles. Shepherding Sam and The Barn and the Book both center on a group of children whose parents take them to visit a nearby monastery, particularly Sam, a boy who isn’t thrilled about these visits and doesn’t fit in well with the other children. He finds a buddy in Saucer, a relentlessly cheerful Corgi at the monastery who adopts Sam as his personal project. I particularly liked the relatable cast of characters— from the bossy girl who always knows what the Right Thing is, to the sweet and uncertain Sister Anna who has the (she thinks) unfortunate, and definitely challenging, task of corralling these children in Sunday School class. This set would be a perfect St. Nicholas Day gift for a child! We sure are blessed to have so many great resources for our kids these days!! Obviously there are aspects of royal life that dazzle and intrigue most of us. (How many of you woke up at the crack of dawn to watch the Royal Wedding this year!?) My wedding day was one of the most wonderful days of my life, and how did I feel? I felt like a princess. In the Orthodox Church you are crowned King and Queen of your household for a reason. While any kind of powerful monarchy is several generations away from us, the church still retains a sort of royal nature. Ever feel like a prince or grand duke is visiting when your Bishop comes into town? Or like you’re bowing before a royal procession during the Great Entrance in the Liturgy? How do we separate post-modern culture’s perception of “royalty” and the church’s ancient reflection of it? When the three of us met to discuss style, we looked at an assortment of artistic imagery of saints. Orthodox icons are always a centerpiece in terms of guidance and church teaching, but we didn’t adhere to the exact line work or inverse perspective that icons require… Marian painstakingly drew every saint included in the coloring book with incredible detail and precision. 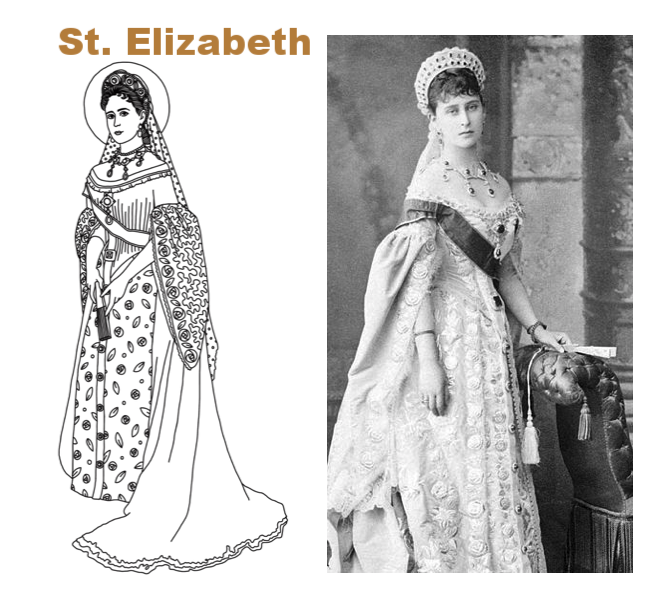 The saints are shown during the royal season of their life; Some look similar to icons, while others are taken from actual photographs of the saints. The borders were drawn by me, and I used a style I would describe as “modern folk art.” Each border tells a story with plants and flowers from the region, hobbies of the saint, or important pieces from their life. As a team, we talked a lot about how we wanted this coloring book to be a tool for parents and a source of discovery for children. The pages are perforated so the saints and their stories can be torn out and shared. In writing the saints' lives, we decided to go with a style of language that would read like a story for young children. Dialogue was included in certain instances to give the reader a sense of each saint’s own voice and spirit. The stories read more like a work of literature with a definite sequence over the course of the saints' lives. The narrative style lends itself better to early literacy skills that are appropriate for many young children. Caroline integrated the two artistic styles with manuscript lettering and made the pages flow seamlessly from one saint to the next. The arrangement of each page shows an ebb and flow from the image of the saint to the story of his or her life. The impetus behind the work we do at Draw Near Designs is almost always multifaceted. The guiding questions are usually: Is it beautiful? Is it educational? Would we buy this for our own children? With these guidelines, the coloring book has turned into something that can be used in multiple ways. I envision it as a homeschool resource during our morning readings and as an engaging coloring sheet later in the day. Many of the saints we chose were married to one another or somehow related (eg. 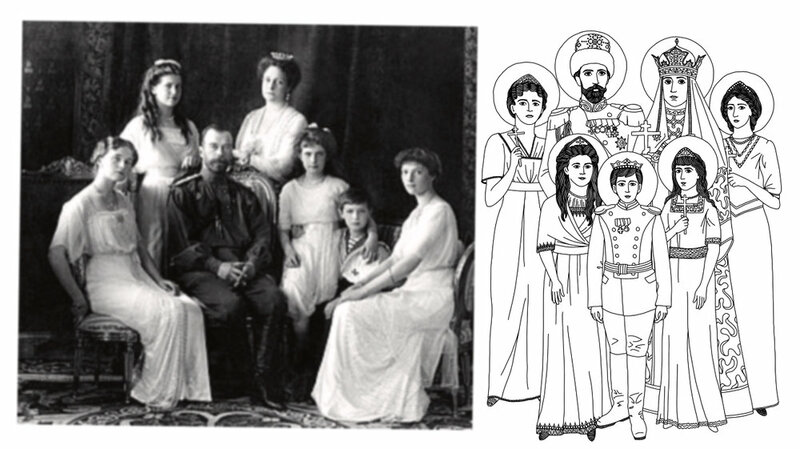 Abigail and David, Emperor Justinian and Queen Theodora, The Romanov family and St. Elizabeth). There’s a real opportunity for making connections, inferences, and predictions from one story to another. Take a look at the drawings, read the stories, and notice the humanity that is woven throughout this coloring book. These were real people who lived lives as kings, queens, and emperors… but they also extended their roles as leaders beyond earthly barriers into saintly examples. I pray that through their lives, my children might learn to separate the wheat from the chaff in our modern culture of all that glitter and shines, and notice Godly virtues that allow us to glow from the inside out. Welcome "The Artful Educator" to the Marketplace! If you all haven't already seen The Artful Educator online (or in person! ), we are delighted to introduce you to this phenomenal wife, mother, entrepreneur, and Orthodox Christian! By day, Kim Votruba-Matook is a mild-mannered mama and Director of Content & Branding for a community-building start-up. When she hears the call of a curious kiddo or senses the need for creative consult, she becomes The Artful Educator (not-so-coincidently the name of the graphic design company she founded in 2015)! Fueled by black tea, chai lattes and macaroni and cheese, she spends all the time she can creating and sharing educational art to inspire a love for learning wherever she goes. She continues to hone her superpowers of transforming two tiny humans into responsible global citizens as well as her ideas into delightful and artful educational tools. And when she can, she has dance parties in her kitchen because she knows every moment matters and can (and should!) elicit joy. Kim's bright and bold educational art can be seen at www.theartfuleducator.com. "The Artful Educator’s mission is to help families engage in learning at every opportunity. Everything in this world has inherent beauty and a story; they can inspire a meaningful conversation with the children that you cherish. 1. The (limited) time we have with our children should be valuable, meaningful and fun for all involved. 2. Educational opportunities are everywhere. Sometimes we need help finding them. The Artful Educator™ sets out to solve a challenge I faced as a life-long learner becoming a mom. When my son was a newborn, I started looking for educational nursery decor and all I found was the standard “A is for apple” items. I didn’t really understand why a letter was being reduced to a single item. Life is so beautiful and complex, why couldn’t I share that in a positive way with my newborn son through art? Since I couldn’t find what I was looking for, I created it. My products encourage a world of wonder through art infused with educational content that is easy to incorporate into a daily routine. It’s called the Artful Alphabet™. The Artful Alphabet™ is exactly that. All the letters of the alphabet are designed as a mosaic of objects that start with that letter (A includes asparagus, Alabama, ant, ampersand, etc.). Then all those letter-specific items are filled in with a color that also starts with that letter (A in Aqua, B in Burnt Sienna, C in Chartreuse, etc.). So, from far away, you see an alphabet letter. Then when you zoom in, you see the one to three dozen items that form the letter and can inspire educational conversations. It’s educational on myriad levels; families can engage with the art at whatever level their children are ready to enjoy. The objects within each letter prompt discussions about geography, nutrition, the animal kingdom, sports and activities, among many more topics, totaling 675 points of conversations at a glance. The Artful Alphabet™ currently takes the form of flashcards, placemats, wall art, drawstring bags, and note cards (with inspirational quotes!) to help adults and kids truly be surrounded by educational opportunities. Through The Artful Alphabet™ (my original art), educational opportunities in everyday life are illuminated and showcased as meaningful points for conversation. Small things – from apricots to marbles to zippers – can and should give us pause in our busy days and bring the focus back to our relationships with the present moment, the world we live within, and each other. I also want my art to serve as an affirmation that everyone has a unique perspective and story to tell. Everyone, regardless of age, should be confident that their experience and connection with the world is enough and absolutely worth sharing, especially with the next generation. It is paramount that families authentically connect with eye contact, conversation and shared experience. Art and education can inspire this; they can provide myriad perspectives and interpretations, while sparking storytelling, curiosity, and wonder for the world." Anyone balancing parenting and working knows the balancing act it can be, not to mention owning and running your own small business (trust us, sometimes it's a madhouse!). We asked Kim to share a struggle she faces as a mother and entrepreneur, and what her favorite part of it is. Her biggest challenge: "Being kind to myself. There are definitely days when I work hard on and in my business and I don’t make a sale. I struggle with negative talk on those (and most days) because I always think there is something more I could be doing for my business and as a mom. That was actually the inspiration for my quote cards! I needed something to counter all the negative talk in my head so I found encouraging quotes for every letter of the alphabet and printed them! I use them any time I need a boost! Building a business takes time; I need to be patient with myself, pray more for guidance, and focus on the joy I feel when talking about my passion for empowering families to learn and connect together through educational art!" And the best part? "Freedom and flexibility with my time. While I am certainly not making as much money as I was when I had a full time job, working part-time, freelancing AND growing The Artful Educator may sound more complicated and busier, but the huge difference is I CHOOSE when to work. That is am amazing feeling! This means the schedule I set for the day is more likely to be completed because I am in control of it (through God’s will, of course!) Waking up and knowing that I can spend time with my kids without always needing to rush out the door is so so so wonderful. Then I can work when I need to, juggle what I need to, and then know I’ll have time to play, read and cook with my two littles (who are 4 and 2 by the way!) is amazing. My life feels joyfully full and I am happy. This happiness emanates and positively connects with my husband and kids and that joy exponentially increases. Of course we have our off days, but ultimately being a mompreneur has been a constant lesson in time management and priority ranking. What is most important is my family, my faith, and my well-being. This new flexibility in time has helped me re-center my life to make sure these three foci are always at the center of my world." Welcome Kim and the Artful Educator to the Draw Near Designs Marketplace! Welcome "Taste and See Studio" to the Marketplace! We are delighted to share a new vendor in the Draw Near Designs Marketplace: Taste and See Studio! Based in Wilmore, KY, Taste and See Studio is run by Geoff Whiteman, a member of St. Athanasius Orthodox Church who is a mission specialist with OCMC, responsible for missionary care. Geoff and his wife, Kriss, also lead marriage enrichment workshops and raise their son, Patrick. Geoff and Kriss do incredibly impactful work, and we are grateful for the opportunity to help support them through their participation in the Marketplace! Please take a moment to check out his website and learn more about his unique ministry to missionaries at http://www.resilientmissionary.org/. Besides balancing work and family, Geoff also creates beautiful prayer ropes that he offers in his Etsy shop, Taste and See Studio (https://www.etsy.com/shop/tasteandseestudio). Several varieties of his prayer ropes will be available in the Draw Near Designs Marketplace! We are especially excited about the adjustable child-size prayer ropes, and matching adult size adjustable prayer ropes. In addition to being handmade with prayer and love, these prayer ropes feature a beautiful olive wood cross from Jerusalem. What a treasure, and a perfect Father's Day present! Our favorite aspect of the Draw Near Designs Marketplace is the chance to support other Orthodox Christians' small businesses, and we are thankful to all the individuals who choose to shop in the Draw Near Designs Marketplace for making this possible! "Old Calendar" Orthodox Children's Calendar 2019- FULLY FUNDED! The "Old Calendar" Orthodox Children's Calendar for 2019 is fully funded!!! From April 10-May 10, Draw Near Designs hosted a crowdfunding campaign to fund the printing of a special edition of the 2019 Orthodox Children's Calendar with Old Calendar (Julian Calendar) dates. We are delighted and overwhelmed with gratitude to share that through the support of Orthodox Christians from all over the country (and Canada too! ), the campaign was FULLY FUNDED! Some people took advantage of the opportunity to add a saint of their choosing to the calendar, some got to pre-order their calendars at a discount, and others chose to generously donate to the project. We truly felt honored to have the support of so many! Thank you to EVERYONE who pre-ordered, donated, and helped spread the word about this project. Last year we had frequently questions about an "Old Calendar" version of the Orthodox Children's Calendar, and we are so pleased that this year we will be able to say make that available. Hello all! (Abigail here) I hope everyone has had a blessed Bright week and is still enjoying the Paschal season! We are still singing Christ is Risen as loud as we can in our house, and enjoying all the meats! In Draw Near Designs news, we are 12 days into our (30 day) Old Calendar Crowd funding campaign! We have raised $605 of our $3,338 goal. (18% funded). We have 18 days left and 82% of our goal to be raised. This project was brought to us again and again by people who follow the "Old Calendar" (Julian calendar) to PLEASE make another version of the Orthodox Children's Calendar better suited to their family's' needs. It was clear this was something important to the folks writing us and we wanted to give this new sprout of the calendar business a healthy start. For us, the most responsible avenue was to do another crowd funding campaign and find out if there were enough "backers" to support this new venture. There are 18 days left to help decide the answer to that question! 2.) Pick tour saint and add it to the calendar ($80, and your saint will appear on the old calendar and new calendar version). 3.) Make a donation (you entire donation will go towards this project). All people who pre-order will be the VERY FIRST to receive the calendar once it's ready to ship! -tell your friends that are Old Calendar to order during this window! -order a copy for yourself, your friends' Christmas presents, Godchildren, etc! Well, I'm off to put the babes to sleep! Thanks for participating in this process with us! Wishing you a blessed week! I hope you're all having a great Holy Week thus far. I know personally, ours has been exhausting already and we haven't even gotten into the thick of it yet... But that's what I love about Holy Week! It's so tough and you're working so hard to prepare your house/kids/mind/spirit/church/everything for Pascha! Then the feast comes and it was all totally worth it and it's just a teeny tiny glimpse of what our Royal Banquet will be like in heaven. I was just thinking today about how awesome this opportunity is. To get to live out the resurrection each year and fast and push ourselves spiritually is such a beautiful blessing from the church. It also dawned on me this morning as well that we get the opportunity to adjust our fasting and Holy Week practices each year. So maybe after Holy Week this year, we look back and say, "That was a little too much for the kids." or "Maybe we didn't need THAT much food for Bright Week..", or "I felt like I was so distracted by my phone/tv/work this past Holy Week." These are some things I have found myself saying in Bright Weeks past. Well, Lord willing, next year we have the opportunity to do it all again and focus more on what's important. I try to be graceful to myself as I think about what I would have done differently each year, but also earnestly ponder adjustments for next year to make Lent more meaningful for our family. What a blessing from the fathers to look the death and resurrection of our Lord in the eye each year, and to ponder the final judgement, but then have the freedom and grace to grow even more in the next Lenten season. It's like annual practice for the Last Judgement. I know, I know, that's the point. But today, I got to think on it for a bit and mull over the beauty of it for about 3 whole minutes before being called away by crazy toddlers. Wishing you all a blessed Holy Week! Here are some Pascha cards that I made for our kiddos to color and decorate. If you like the illustrations, they are from our Pascha to Pentecost coloring book available here.